The Amazon Echo Dot is an amazing smart speaker that is perfect for your smart home. There are dozens of Echo Dot accessories that make this device even better. 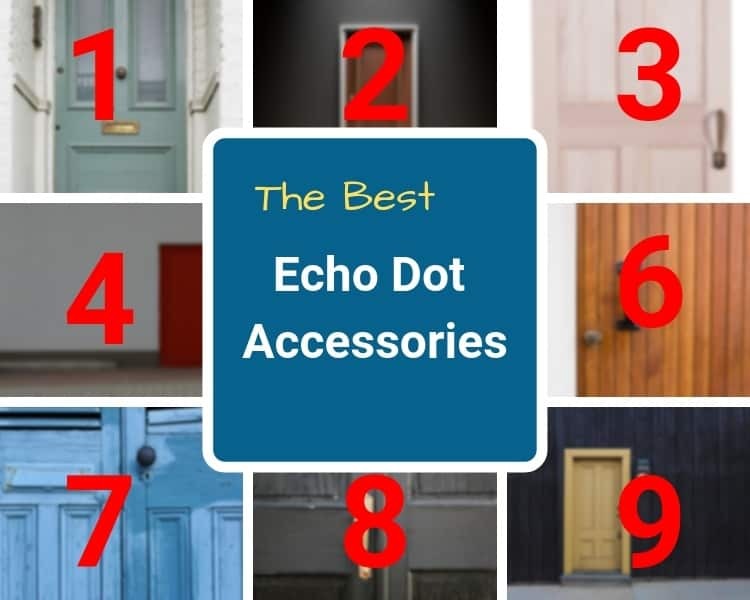 Check out the list below to discover the best Echo Dot accessories to add to your home. Wall mounts are the perfect accessory if you don’t have counter space for your Echo Dot. Wall mounts allow for a clean look without long and ugly cords. The mounts also keep the Echo off the counter were it is more prone to spilled liquids. These mounts are perfect for a kitchen, bathroom, garage or any other location with higher level wall plugs. The two best types of Echo Dot wall mounts are plug-in mounts and flush mounts. Plug-in mounts hold your Echo Dot using a standard wall plug. Flush mounts require a little more work and wiring but everything is hidden in the wall or ceiling. The Matone Outlet Wall Mount has options for both the Gen 2 and the Gen 3 Echo Dot. This wall mount is my favorite accessory for the Echo Dot. The Matone Wall Mount allows for a clean install with a very short or hidden cord. Installation is super simple by just plugging in the device. This Echo Dot wall mount can be installed horizontally or vertically so it should work in your area. Additionally, the mount still allows you to use the second plug in the outlet. In my experience, there wasn’t any impact to voice recognition or sound quality using this mount. I have one on the wall in my garage and it is also perfect for the kitchen or bathroom. ​The Mount Genie Flush Mount is a great solution to completely hide your Echo Dot in your walls or ceiling. Mount Genie includes options for the Gen 2 or the Gen 3 Echo Dot. Installation requires some wiring as power must be supplied to the device. Both models include the required wires to power your Echo Dot. Your installation location needs to be within 10 foot of an outlet for Gen 2 devices and 12 feet for Gen 3 devices. Mount Genie also sells a POE (Power Over Ethernet) adapter if that is your preferred installation. Cases are one of the most popular Echo Dot Accessories. A case can be used to accentuate or hide your Echo Dot. Either way, there are multiple options so you are sure to find an Echo Dot case that fits with your decorating style. Echo Dot cases can be found in fabric, leather, silicone and wooden material. All cases are designed to ensure that there isn’t any impact to sound quality. Stands are a great accessory for the Echo Dot. They are especially useful for displaying your Echo Dot on a desk or entertainment center. Stands position the Echo Dot so you can easily see the blue circle notification lights when the speaker is actively listening. Many people also claim that the stands improve the voice recognition range and the sound of the Echo Dot. Personalize your Echo Dot style with a vinyl skin wrap. There is a huge selection of skins available for you device so you are guaranteed to find a style you like. The Echo Dot skins are made from a high quality vinyl that is removable and does not leave a sticky residue. Choose a skin that is decorative or fun! The Echo Dot is a great device to expand voice control throughout your home. It’s small profile and low price easily allow you to place the device in multiple rooms. The benefits and convenience of the Echo Dot is obvious and the built in speaker is great for news, weather and other general information. However, the Echo Dot speaker falls short when it comes to playing deep, room filling music. The good news is that you can easily connect an external speaker to your Echo Dot. You can connect an external speaker using a 3.5mm cable, Bluetooth or some Wi-Fi connected speakers like Sonos and Bose Soundtouch. The Sonos Play 1 and the Bose SoundTouch 10 connect perfectly with your Echo Dot. You can set these as your “Preferred Speaker” in the Echo Dot settings so music will automatically play from them. This isn’t available with all speakers which is by I prefer Sonos or Bose Soundtouch. I personally use Sonos in my home. The Echo Dot is a great device to add voice control to your smart home. The Echo Dot doesn’t have a ZigBee or Z-Wave radio, but it can control many Wi-Fi based devices. The lists below contain the best Wi-Fi based accessory devices for the Echo Dot. If you want to add additional smart home features and devices, then I recommend using the Samsung SmartThings controller. Smart Plugs are great for controlling lamps, fans and other small appliances. You can check if you device will work by turning it on an unplugging it. Then plug it back in to see if it is still on. If so, then you can turn your device on and off with a smart plug. Size is an important factor when selecting your smart plug. Make sure you can still use the second outlet on your wall plug with the device you choose. The devices listed below all leave the second outlet open for other uses. Controlling lights with your voice is one of the best features of a smart home. There are two Echo Dot accessory options for smart lights: Wi-Fi based lights or lights connected with a hub. Wi-Fi based light bulbs each connect directly to your Wi-Fi network. Hub based light bulbs connect to the hub using ZibBee, Z-Wave or other proprietary connections with only the hub connecting to your Wi-Fi network. I prefer the second option for increased reliability and to keep Wi-Fi interference to a minimum. The table below contains the top smart light accessories for the Echo Dot. The color starter packs provide the most value, but you can expand your lights with white bulbs for a much more affordable price. You can control the temperature of your home by voice with a smart thermostat. Adjust the temperature without getting out of bed! Smart thermostats provide many more benefits than voice control, but it is a very handy feature. Control your TV programming by voice with the Fire TV Stick. Pause, play, rewind, fast forward, search and more. The Echo Dot and the Fire TV Stick are a great pair. Your Echo Dot can act as a doorbell chime with Ring Doorbell. Play classic chimes, music or special sounds when the doorbell is pressed. Add an Echo Dot to any room where it is hard to hear the doorbell. Your Echo Dot can help in the kitchen with an Alexa Microwave. Alexa, “Add 30 seconds to the microwave”. This is a great option if your hands are full or dirty or if the person is visually impaired. Easy see all of your timers with a connected Alexa Wall Clock. This is a great Echo Dot accessory since one of the most common uses is a timer. This clock uses batteries so it can easily be placed anywhere in your home. My favorite Echo Dot accessory is the Philips Hue smart light bulb. We control these devices with our Echo Dot every single day in our home. My second favorite accessory for the Echo Dot is the Matone Outlet Wall Mount. I use this mount for the Echo Dot in my garage and it gives me a nice and clean look on the wall. What is your favorite Echo Dot accessory? I have just purchased Echo Dot speakers for my home and I love them. Thank you for posting all these accessories that I could use with my speakers!